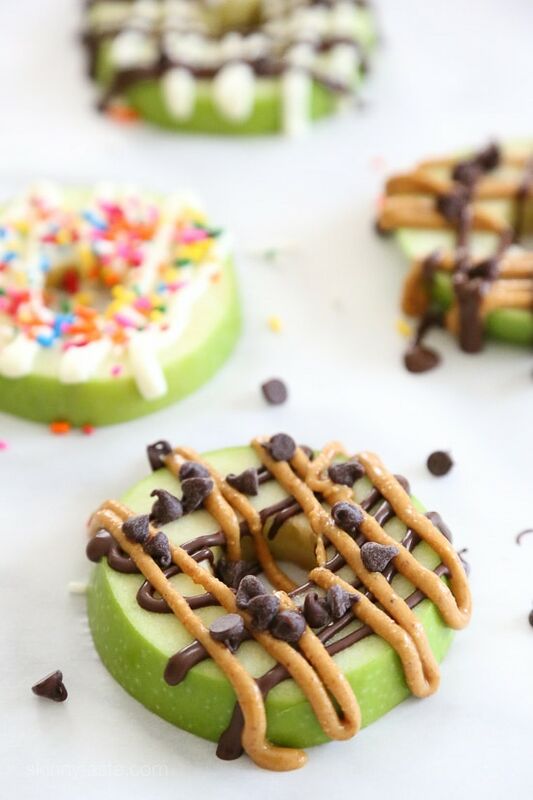 If you’re going apple picking and need a fun, healthy treat – this is it! 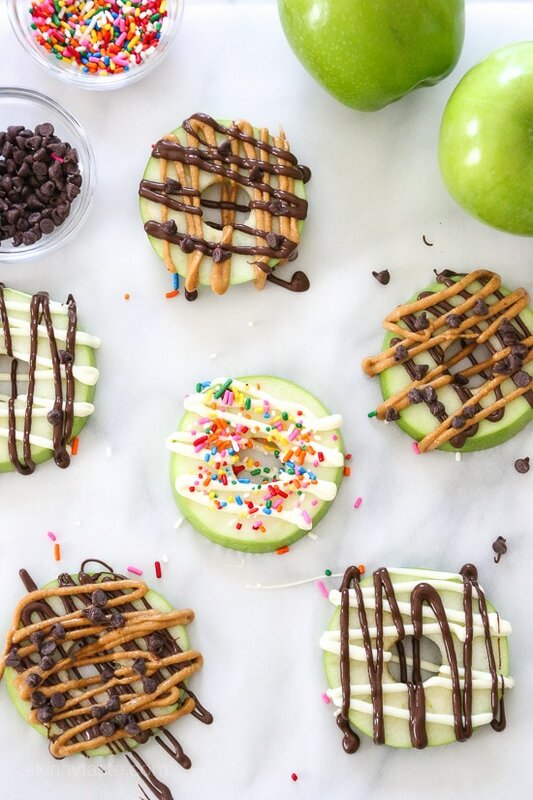 I’m in love with these apple treats, great for the kids or even adults. Drizzled with anything that strikes your fancy, here I did a variation with PB and chocolate as well as some with just chocolate. Caramel would also be great to give you a caramel apple combination! It’s apple season in New York, so when I got my hands on a review copy of the I Heart Naptime Cookbook and saw these adorable apples, I new I had to make them. 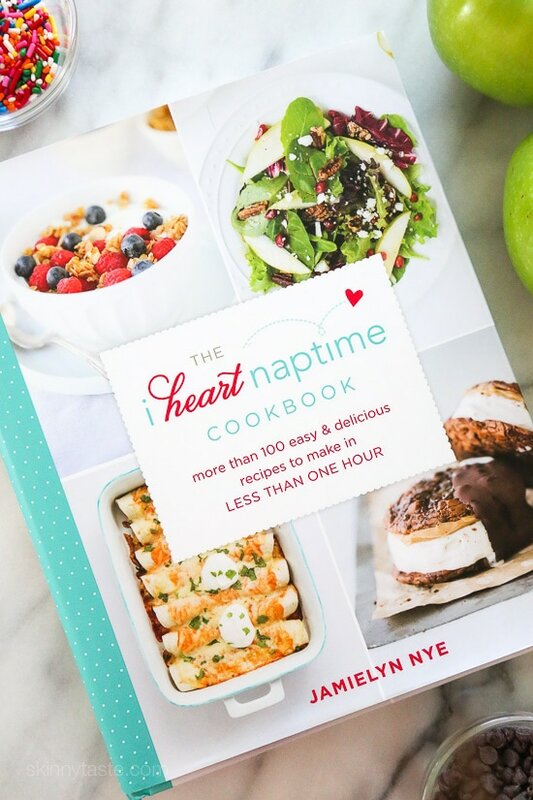 This cookbook is beautiful, filled with easy family-friendly recipes, and every recipe which take less than an hour to prepare. 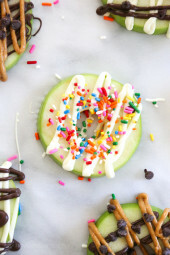 These apples are really easy to make, and perfect to make with the kids. My favorite was the Chocolate and Peanut Butter, which is the perfect snack to satisfy a sweet tooth. Jamielyn also suggest marshmallow cream and sprinkles as her kid’s favorite option. I calculated the nutritional info based on each drizzle with 1/8 oz of chocolate and 1/8 oz of peanut butter. If you swap white chocolate for peanut butter, the nutritional info is very close and the points were the same. I’m in love with these apple treats, great for the kids or even adults. Drizzled with anything that strikes your fancy, here I did a variation with PB and chocolate as well as some with just chocolate. To melt chocolate, in a small bowl microwave 30 seconds, stir, repeat until melted. To melt peanut butter, microwave in a small bowl 30 seconds. Transfer to ziplock bags if you wish for easier piping, or you can use a spatula or spoon to drizzle it over the apples. Slice the apples into 12 1/4-inch thick slices. Using a 1-inch round cookie cutter, core the apple slices (or you can use a knife). 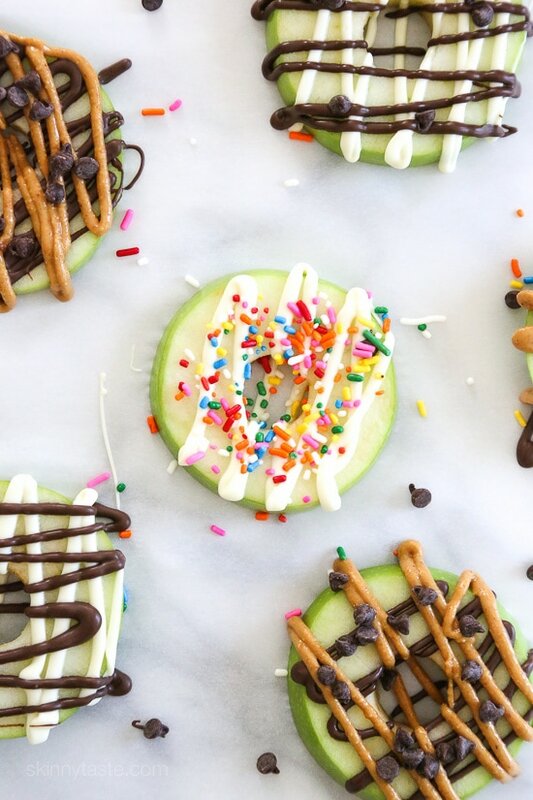 Place the apple slices on wax paper and drizzle with your favorite toppings. Eat right away. Apples brown quick, you can put lemon juice on top to prevent them from browning. *Nutritional info based on 1/8 oz chocolate and 1/8 oz peanut butter per slice. Yield: 12 Servings, Serving Size: 1 "donut"
These look fabulous. Can they be frozen if I use Envy apples which don’t turn brown? No should be eaten fresh. 2 SP for a snack is a bit much. Did you use regular peanut butter or PB2? I would think that 1/8 tsp. of PB2 would be negliable. 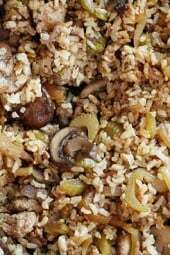 Love your site and your recipies. Hubby even likes that they do not “taste like diet food”. Thank you! Regular peanut butter but feel free to make them how you wish. 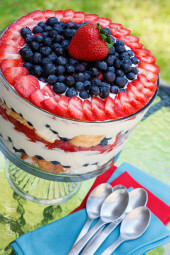 The apple slices are also very yummy spread with peanut or other nut butters and then topped with blueberries, strawberries and/or bananas. Would this taste as good with a red apple like honeycrisp? I’m keeping this one! Great idea! 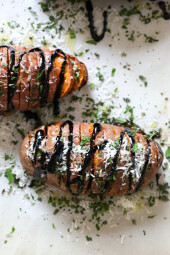 One question, shouldn’t the slices be brushed with lemon juice to prevent browning? Thank you for the recipe. Yes if you don’t eat them right away, I would! You can also soak the apple slices in club soda for about 3 minutes to prevent browning! Doesn’t add a sourness that lemon juice does! I use pineapple juice instead of lemon juice…any acidic juice will work! 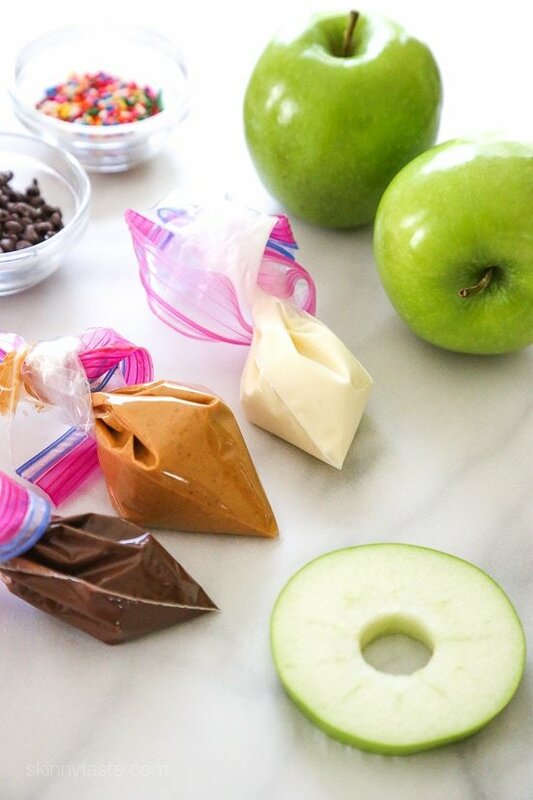 add a popsicle stick and you have something way easier to eat than a candy/caramel apple. …. Love this idea. I love dessert, but even skinny desserts are too many points for my liking, so this is the perfect way to scratch that sweet itch and a great idea for sweet healthy snacks for kids. Cute snack idea! Love it!